A game by Steve Collins of Herobotix and Badlands fame. Tran was fully completed apart from the music. Sadly when presented, Hewson rejected it, due to striking simularities to another title on their label. All this, even though it got good review scores internally within Hewson. Steve could not find time to get someone else to publish it, as he was busy at college, and so it gathered dust and remained so.. The game is based around a sideways space scroller in the mould of Defender, Uridium, Parallax and R-type, with the usual arsenal of weapon upgrades. The aim is to simply blast enemy crafts and collect orbs. When enough are collected, you are able to land and take control of the man on terrain, blasting enemies and saving hostages whom are imprisoned by blowing doors up with bombs. Once all the hostages are saved, its time to find your ship and blast off. When fully specced, you have 6 orbiting droid orbs, each with a lazer cannon. You can have forward and rear double cannons and also sid strafing bazookas. Originally, Tran was first heard about after Steve’s site was stumbled across, where he mentioned two unreleased games he worked on. Tran was one of them, and after contacting Steve, he confirmed that Tran still existed at home in Ireland. 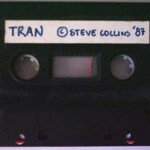 In 2004, Steve found the last known copy of Tran on a small black tape and posted it to GTW. The tape was tested, and the game worked straight away. After converting over to a TAP file and some fixing to a .PRG file by TMR. The game can now proudly be hosted on GTW for all of you to enjoy for the first time ever. It is a space blaster, typical of 1987 with some great highlights, some nice graphics and starfield and some classic gameplay which can now be enjoyed by the gameplaying public as intended. "Tran was completed (except for music) and submitted for approval to Hewson (who published Herobotix). Unfortunately the game was similar to another on Hewson's label so they declined to publish it despite it getting a strong internal review. It was a sort of 2D scrolling cross between Uridium (straffing a planet with waves of enemy ships coming at you) and Parallax (you land on the surface and run around shooting things and rescuing hostages). At this stage I was too pushed for time (was at College), so I never pursued getting it published elsewhere. In retrospect it was better than some stuff out there, but far from being a great game." "A split screen scroller in the mould of defended and R-type with the usual arsenal of weapon upgrades. When fully specced you had 6 orbiting droid orbs, each with lazer canon, you had forward and rear double cannons and sid strafing bazookas. Fun! Was never published though as a result of some legal problems."